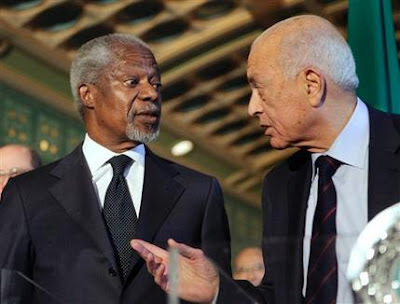 Kofi Annan, the former UN secretary-general recently named joint UN-Arab League Special Envoy to Syria, arrives in Damascus tomorrow, Saturday, for troubleshooting talks with President Bashar al-Assad. Abdul Rahman al-Rashed -- managing director of Alarabiya TV and a media powerhouse in the Saudi establishment --sees Annan embarking on another farcical mission masterminded by none other than Arab League Secretary-General Nabil Elaraby. The Arab League learned nothing from the harm inflicted on the Syrian people by dint of Sudanese Lt.-Gen. Mohammed Ahmed al-Dabi’s scandalous mission. The scandal of the observer mission helped bail out the Syrian regime with a distorted Dabi report meant to cover regime crimes by saying protesters were killers, the same as the government. Dabi’s final report helped Russia’s UN representative justify his veto at the Security Council, giving Assad forces a green light to use heavy weapons in killing Syrian civilians. The League is now coming back with a bigger farce. It recalled former UN secretary-general Kofi Annan from retirement – probably his first invite since leaving his office at UN headquarters in New York – in order to join the Syria mediation mission. Like Dabi before, Annan’s past is tainted by prewar Iraq’s oil-for-food program. Unfortunately, the Arab League under Secretary-General Nabil Elaraby is the Trojan Horse executing Iranian and Russian orders. Theatrical missions concocted by the Arab League simply succeed in covering up the Syrian regime criminal tracks and in making world public believe the organization is not sure who is killing whom in Syria and has an Arab solution up its sleeve. The solution the Arab League secretary-general raves about is the Iranian solution. He proposes cooperation between the regime and the opposition to keep Assad as president managing the security and military services, and to give the opposition a share in government ministries. Whoever is familiar with the regime knows that even the position of prime minister is valueless. In practice, the negotiations venture espoused by Elaraby and the negotiations framework he devised – even if successful – are totally unacceptable to the Syrian people, as they would keep all pillars of the regime in place. Elaraby would have gotten Annan out of bed to bring about more bloodshed. The regime in Damascus will deem the Annan mission to be a second authorization from Elaraby to conclude the killings. That’s because the regime believes fruition of the mission in say six months or more would only mean conceding some ministerial portfolios, such as Trade, Agriculture and Communications. The deliberate or induced backstabbing practiced by Elaraby is worse than the Syrian regime’s wrongdoings. That’s the painful and heartbreaking truth. By co-opting their schemes, Elaraby allowed the Russians and Iranians to forestall the shaky Syrian regime’s collapse. He blocked the opportunity to punish the regime and boot Syria out of the Arab League as its overwhelming majority agreed four months ago. Blame for such shameful roles will fall on the Arab League after the regime’s demise. Elaraby and his league will then face mothers and relatives of thousands of victims who are aware that he caused the death of their loved ones. What’s happening in Syria has nothing to do with conspiracies as his circles claim. Only one fact explains the bloody violence: The Syrian regime’s criminal nature is such that it is mounting genocidal operations, deliberately and mercilessly. It is killing civilians as well as whole families, including women and children, simply to take revenge and intimidate. The conspiracy is not in toppling a brutal regime but in supporting it.